Explore o encantador bairro de Sasso Caveoso, na cidade de Matera, em uma excursão a pé de 2 horas com um guia local experiente. Visite uma caverna, uma igreja e o centro histórico, ouvindo sobre a fascinante história e a arquitetura subterrânea da cidade. Veja as partes da famosa Sassi de Matera, antigas cavernas que ainda estão em uso hoje e foram designadas como Patrimônio Mundial da UNESCO. Bruna sp? was our guide and was extremely knowledgeable about the town, and history of the region. Was not aware that this included only the Sassi portion of the Matera area. The other area on the opposite side of the valley needs to be accessed by car, separately. Fascinating story how the Sassi part of town has been occupied over the years, right up until Bruna's mother and family were moved out in the 1960's. A must see! 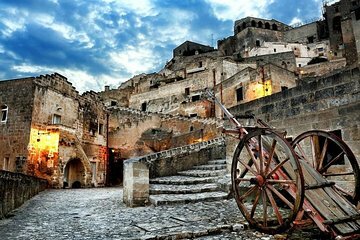 Tour consigliato per vedere per bene Matera e conoscere la sua storia in breve tempo. We had an excellent guide who gave us a full history of the Sasso caves. She was able to answer all of our questions and focused on the highlights of the area. The guide was very pleasant but she could have had more in depth knowledge of the city. The walk was at a good pace and not too demanding for our elderly companion. The guide's knowledge of the rupestre church was excellent. Wonderful tour and the guide was great!